See John's new blog post for April 13, 2014! 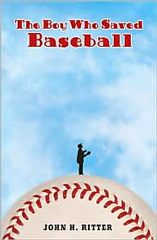 "Throw in some physics, ecology, astronomy, and extraordinary, eccentric characters and this fast-paced, sweet-natured tale is more than a baseball story...for more than just fans." "A boy needs to read the earth. This is a truth older than the iron dust that redpaints the boulders. It's older than the woolback mammoths that're fossiled in these hills. It's a feeling truth, a gut truth from deep inside, that leads a boy to bouldertops on mountaintops, scanning ancient vistas, listening like a perched hawk, reading willow trees for buried water, canyonsides for fruit or meat, and the ridgetops for friend or stranger. This is the truth which cannot be denied. A boy kept distant from the earth is a boy dissatisfied." Order The Boy Who Saved Baseball here.